"Twitter just shut down my @realalexjones account!" Jones wrote on the website’s Twitter page. On Tuesday, CNET Magazine reported, citing Twitter’s statement, that Jones' account was put in a read-only mode for seven days because he violated the network’s community standards. Jones has thereby been barred from tweeting, retweeting or liking posts for the duration of his suspension. Jones is also required to remove the offending tweet, Twitter said, without clarifying to which post it was referring. According to Infowars Editor-at-Large Paul Joseph Watson, the account had been shut down because of a video calling on US President Donald Trump to take action against web censorship. "Alex Jones has been suspended by Twitter for 7 days for a video talking about social media censorship. Truly, monumentally, beyond stupid. On the same day that the InfoWars website was brought down by a cyber attack. Will this madness ever end?" Watson tweeted on Wednesday. Twitter’s move comes on the heels of Facebook deciding to block InfoWars accounts, a move joined by YouTube, Apple, and many others. Twitter previously maintained that Jones had not violated its rules. 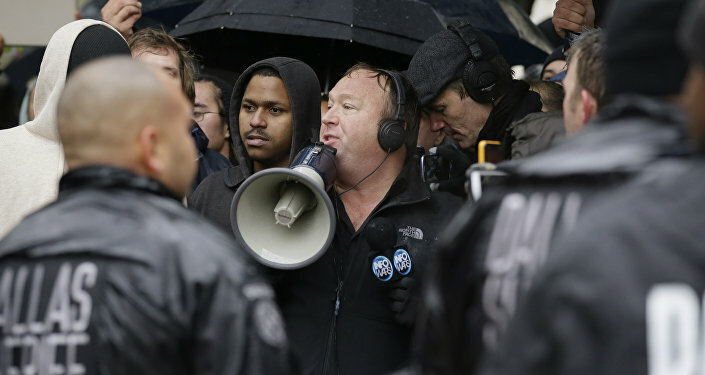 Jones has become famous for his largely discredited conspiracy theories, including those about the 9/11 events and the 2012 Sandy Hook Elementary School shooting.